I always get a laugh passing this road. I truly hope that the abattoir and the rifle range are not one and the same activity. 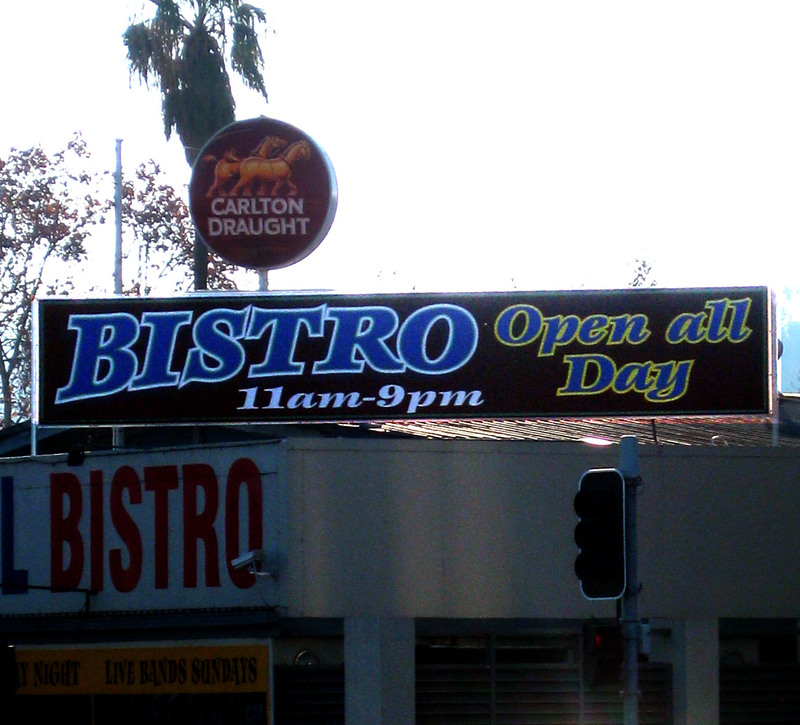 This entry was posted in Fun, Signs on 26 November, 2011 by Chris. This entry was posted in Signs on 29 May, 2011 by Chris. 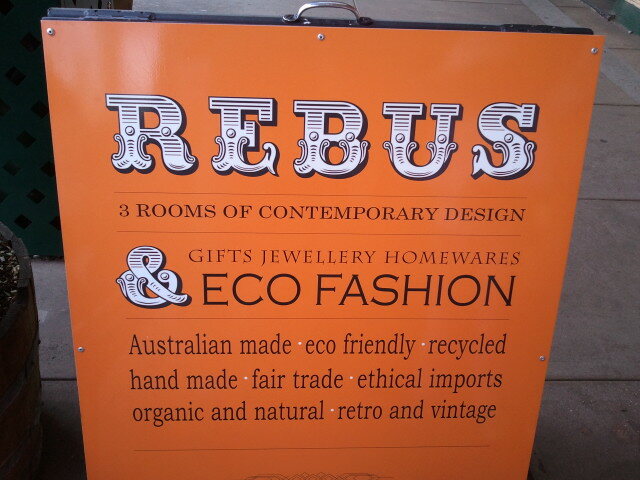 There’s this shop, see, called Rebus. We know what a rebus is, of course. But here are a couple of definitions. Key idea: pictures. It’s visual. It’s not words. Clear? Back to that shop, the one called Rebus. Here’s the advertising A-frame. Did you notice the absence of pictures? The over abundance of words? Yeah, so did I. Perhaps the whole thing is supposed to be ironic. Or, um, or … No, sorry, I can’t think of an alternative. This entry was posted in Signs on 21 April, 2011 by Chris. This entry was posted in Signs on 22 November, 2010 by Chris. That’s another reason not to like red letter Bibles. This entry was posted in Signs on 20 May, 2010 by Chris. Apologies – this image is very poor (lousy camera phone and lousy photographer!). But I hope you can still read the words. I was at a bakery, and spied two professionally-made A-frames hiding in a corner. What would you spend good money on for your business? Would it be signs that earn you nothing, because they say ‘Please don’t come in’? This entry was posted in Signs on 16 April, 2010 by Chris. In Albury, there’s a campus of Charles Sturt University. Podiatry is a local course, and they run a low-fee clinic as part of the training. Good idea! I believe the word you want is excepted – there’s a rule about parking, and it has an exception. This entry was posted in Signs on 31 December, 2009 by Chris. The type of sticker took me back! Can you see the instructions (top left)? Moisten this side to adhere. I remember putting stickers like this on my bedroom windows in the 70s, or on dad’s car windows. They were mainly for footy teams, if I remember correctly. I wonder if this has been the same mechanic business the whole time since 1971, or if the workshop has been a whole string of different businesses. The current business is ‘Roundabout motors’, with no roundabout in sight. This entry was posted in Signs on 21 December, 2009 by Chris. Snapshot taken at Ephesus. 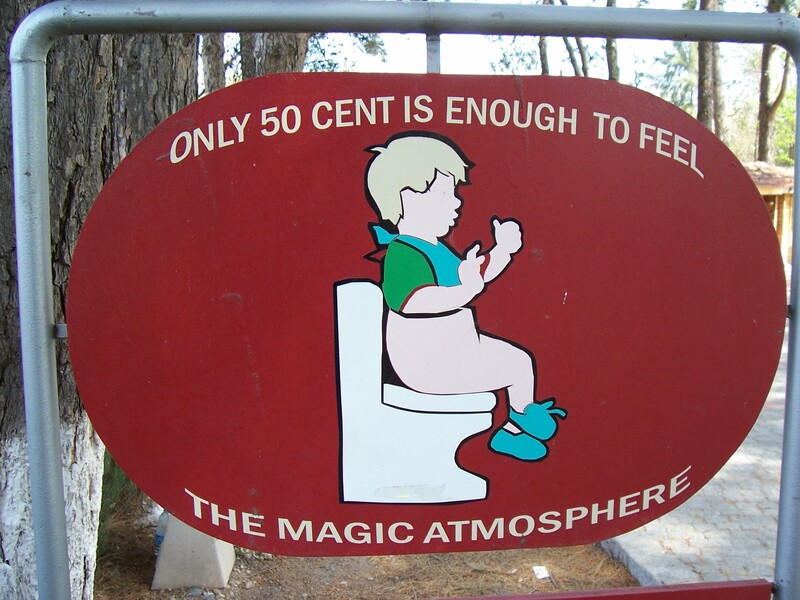 I didn’t need the loo, but loved the image & words. Two minutes later I ignored the ‘Genuine Fake Watches’ sign – there was simply no competition. This entry was posted in Signs on 30 May, 2009 by Chris.